20 – Fouls committed per game – only 4 clubs have made more. 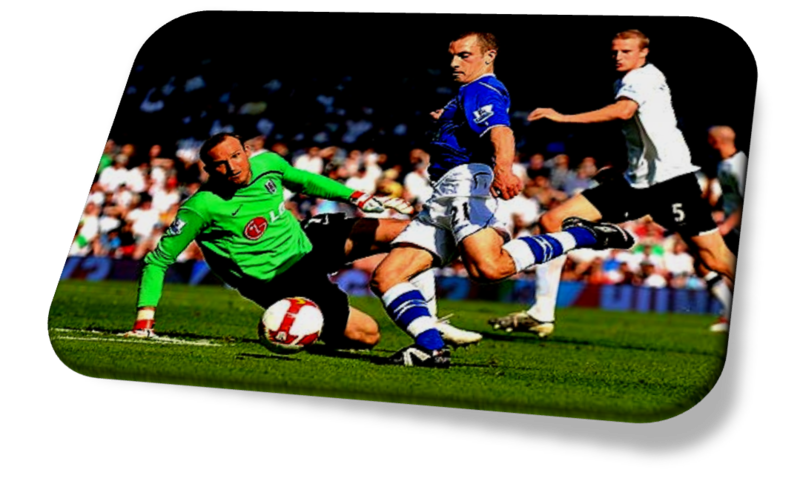 83% – Tony Hibbert headers won – highest figure from the regular starters. 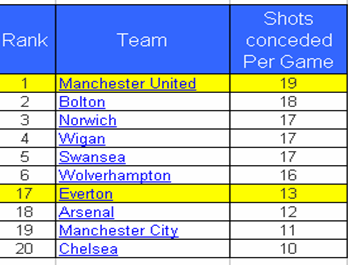 9 – Points taken by Everton in the half time league. 1 less than actual table. 58 – Velios has scored a goal every 58 minutes during his various cameos. 2.8 – Tackles per game made by Fellaini – the most at the club. 0 – The amount of players Everton have in the EA Index for top 100 players in division. 2 – Clean Sheets in 12 months from away games. Many thanks to Opta & whoscored.com for some of the data used in this article. 1. 4-4-1-1 v 4-2-3-1 The key differential in terms of formation was United’s wide players were deployed further up the pitch to press our fullbacks. 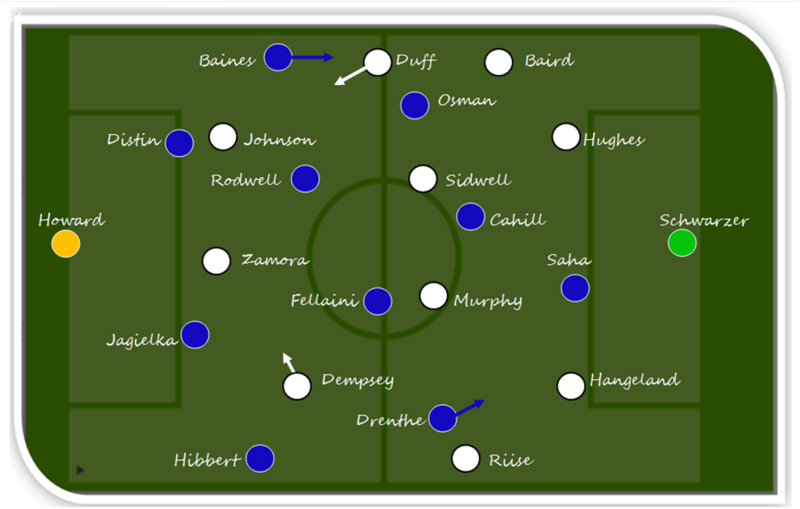 Everton opened up 4-4-1-1 with Osman starting very advanced in close proximity to Saha. Coleman was wide right and Billy was asked to occupy the left flank. 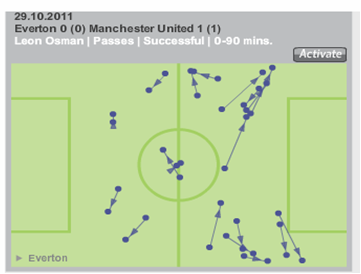 An initial look at United’s personnel would hint that Ferguson was going on the offensive but the opposite was true. United were more 4-2-3-1 with Welbeck and Park playing high up field and Rooney pivoting between supporting Hernandez but mostly as a third central midfielder. Rooney played this role well – adding physicality to United’s midfield and providing the passing range they have missed since Scholes retirement. 2. Blues outnumbered in midfield United started the game the better and got the opening goal just before the 20 minute mark. 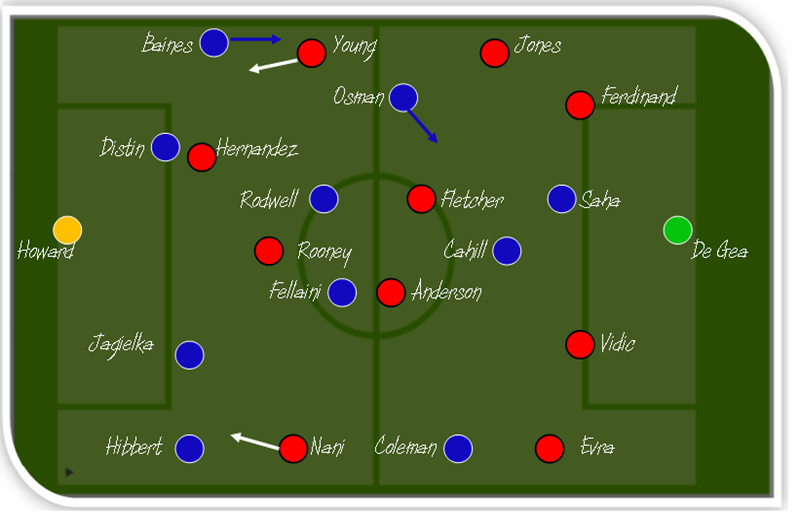 This was due in large part to the fact that in the opening period the Blues were outnumbered 3v2 in central midfield – United making 150 passes to our 116 in this period. With Osman advanced and Rooney sitting more in midfield alongside Cleverley & Fletcher, United had an extra man meaning Rodwell & Fellaini were being bypassed by United midfield triangles. Moyes made the call to ask Osman to sit deeper in midfield to go 3 v 3 with United and from this point the Blues took control of possession making more passes (394 v 333) for the remainder do the game. We also bossed territorial dominance with 33% of the game being played in United’s half compared to 24% in our own area of the pitch which led to more shots (19 v 7) – however De Gea was forced into few meaningful saves. 3. Baines nullified Perhaps mindful of last season when 2 Baines deliveries rescued Everton in injury time, Ferguson played the more defensively astute Park on the right wing – he and Welbeck pinned back the Everton fullbacks for the most part. Whilst there is little point in doing this with Hibbert who provides minimal going forward, eliminating Baines basically takes out Everton’s most effective attacking weapon. Baines clearly misses a decent left sides partner – he received just 5 passes from Billy/Barkley combined and is working on scraps at the moment. 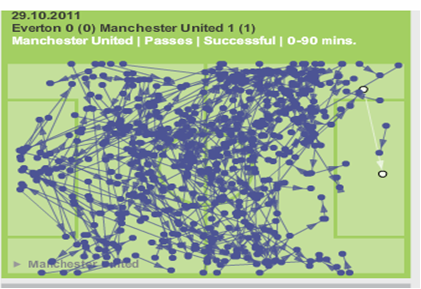 United made a massive 20 interception in total, with Park registering 25% of these. He was specifically blocking off the angle to the supply coming into Baines leading to the roaming wingback registering just 1 successful cross in the entire game. 4. United target our right side United had distinctly less of the ball and seemed to be looking to keep the game tight. The chalkboard shows just how little of the ball they actually had in terms of playing the ball into our box – however there seemed a deliberate ploy to work play out to our right side – (46%) rather than our left (27%) – and eventually this led to the goal when Evra whipped in for Hernandez to convert. Hibbert found Welbeck’ pace and ball control difficult to combat and prior to the goal United almost took the lead when a similar move led to a clear cut chance for Park who hit a tepid shot into Howard’s body. Chelsea recently exploited our right side a few weeks ago, plundering all 3 goals from this area. 5. Familiar lack of incision costs The players worked really hard and more than matched United’s endeavour but we simply lack the final ball to make the possession count. We average just 1 through ball per game this season – the joint lowest in the division. We have sold our 2 most creative players and not replaced them and it shows. Today, Coleman had a fantastic game – alongside Fellaini he was our best player – and was the only midfielder to successfully pass a ball into United’s 18 yard box all-day. Osman was deployed in the ‘No.10’ role but was mute in behind Saha and often drifted out to the flanks leaving Saha isolated. Billy was replaced at half time having posted the lowest pass completion (70%) out of any of the starting line-ups. 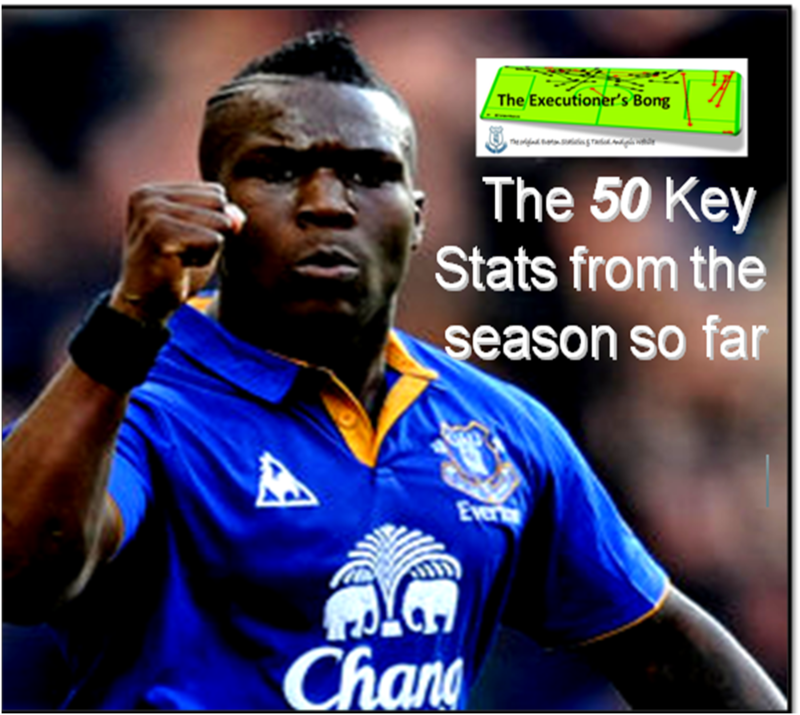 It was even more galling given the impact of Drenthe last week – a player who has genuine penetration in his locker. Whilst I think Fellaini and Rodwell are both good players, neither is the deep lying playmaker we crave. There was an air of inevitability about this one. The Blues huffed and puffed a lot but were kept at arms length for the most part by a stubborn United rearguard marshalled superbly by the commanding Vidic. This was a much improved display to the feeble spanking at the Bridge though and with some winnable fixtures coming up – plus the return of Rosyton – the onus is now on the Blues to put some form together between now and the festive period. Saturday sees us entertain champions Manchester United in a fixture which often provides plenty of incident, bags of goals and the occasional decent result for the Blues. How do you stop this? There are 3 options…. United will look to push play to the wingers from Ferdinand or the 2 central midfielders (probably Fletcher & Anderson) This can be stopped by our wingers blocking off the angles for passes by positioning themselves inside as shown (right) to stop the supply. Alternatively you can push your winger’s right up in a 4-2-3-1 to snuff out the supply from fullbacks. The 3rd way – what Moyes seems to prefer – is to stand off to invite the cross and focus on defending our18 yard box – this is a risky strategy given United’s quality in delivery from either flank- they have scored 8 goals from set piece situations this season – more than any other side – and in Young they have a top exponent of winning free kicks in dangerous positions. United will always look to attack and will give you a chance – even at 1-5 down on Sunday they were committing bodies and leaving 2v3 at the back. This season they seem even more committed to offense – the introduction of the more fluid Young in place of the more rigid Valencia is a contributing factor. They will usually adopt an orthodox 4-4-2 but with Rooney dropping in to make 4-5-1 when not in possession. This offensive approach has led to United shipping a fair few goals this season and they have recorded just 1 clean sheet on their travels in the league. This season their rearguard seems more suspect for several factors. New keeper De Gea has something of a weakness from long range shots – he was beaten 11 times from outside the box last season in La Liga (more than any other goalkeeper) and opposition sides have looked to exploit this. He has looked more culpable from crosses for me though – something which is a specialism for us. As mentioned above United’s strengths are out wide and for this reason I could see us being more 4-4-1-1 than last weeks 4-2-3-1 with our wide midfielders being given more of a defensive brief for this one. Drenthe has been class and his pace, ability to beat his man and ability to win free kicks will be sorely missed. We usually keep quite a high line and press high upfield against United and leave space in behind – last season at Old Trafford Anderson exploited this with numerous long range passes into the space behind our defence – mostly down our left side again which we will need to monitor. Fatigue will obviously be a factor – since United’s mauling last week we have played 2 games – one going to extra time – in contrast United fielded a reserve squad atAldershotso will be much fresher. Our game is based on pressing and work rate and maintaining this over 90 minutes will be tricky. Unexpectedly after their calamitous displays in midweek, both Heitinga & Mucha will return to the bench. Billy had a good game and will be pushing Coleman for a start here but I’d expect him to start from the bench also. I really can’t see United shutting us out and with our own defensive woes this season I could see this one providing plenty of goals. Last season’s encounter witnessed us score 2 against Utd in injury team whilst United scored their winner against us in the fixture at OT in injury time. This, coupled with the fact that we’ve scored 60% of our goals in the last 15 minutes of games this season means it could be setup for a grandstand finish….so don’t leave early. I’m going for a 2-2 draw. Our 3 attacking midfielders were playing quite narrow with Baines providing the real width – often the left sided marauder was playing ahead of the midfielders as an auxiliary left winger. 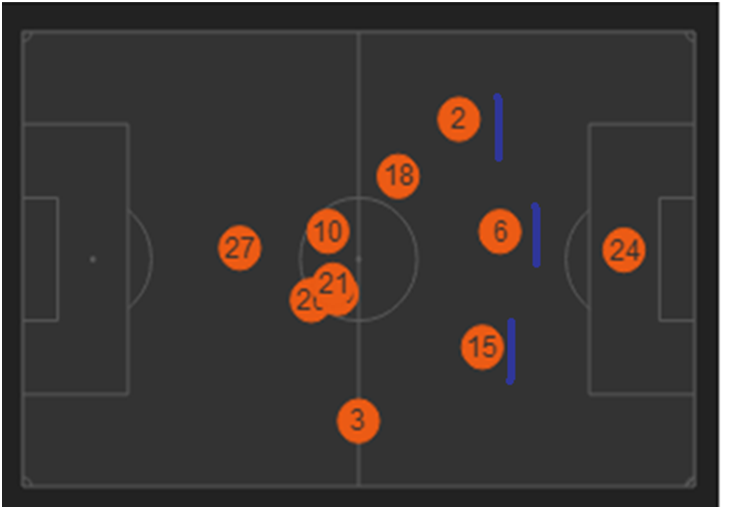 The Blues at times were holding a back 3 of Distin, Jagielka and Hibbert who tucked inside with Neville in front keeping an eye on Dempsey– see average position chart (below) This was due to Fulham predominantly attacking down the middle of the pitch. The display of Drenthe was one of a true match-winner. In the preview we optimistically predicted he might start right wing and his inclusion was rewarded instantly. Good pressure from Fellaini followed by some slick passing enabled Drenthe to take possession of the ball and strike a truly superb goal. Drenthe posted a sublime 95% pass completion and was heavily involved in all Everton’s enterprising play. He also had 2 shots on target, 2 successful dribbles and created 2 chances for teammates. Fulham changed things around just after the hour mark, Ruiz replacing Murphy and Jol switched to 4-1-4-1, with Andy Johnson shifted wide right and Ruiz and Moussa Dembélé in behind Zamora. Rodwell was one of our top perfomers – as well as the goal and assist, he posted 90% pass compeltion – bettered only be Drenthe. A key facet to our play is set pieces. Arteta and Pienaar were masters at winning freekicks in or around the opponent’s 18 yard line. Drenthe has this ability in his locker too. 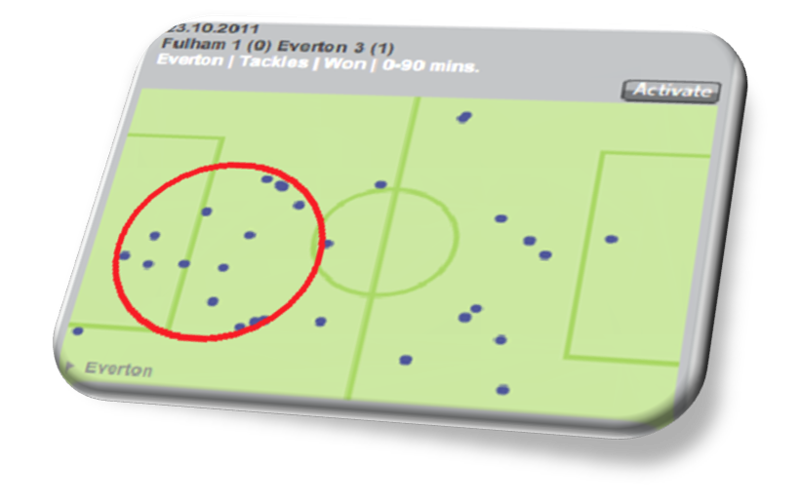 He was the most fouled player on the pitch – upended 8 times – and the chalkboard (left) shows many of them were in dangerous areas (circled in orange) which Baines could exploit. Fulham pinned us back for lengthy spells and will feel hard done by a 1-3 reverse. The game ulitmately turned on a moment of madness from current Fulham striker Zamora missing an absolute sitter – closely followed by a moment of inspiration from ex Fulham forward Louis Saha at the other end. The Blues have one of the fittest sides in the divison – last season we scored the highest amount of our goals (27 % ) in the last 15 minutes – this season the Blues have recorded a staggering 60% of their goals in the last fifteen minutes of games. This win was crucial given recent results and the Chelsea/Man Utd double header this week. Sunday sees us head to Fulham in a game which offers some respite from the gruesome run of fixtures the Blues currently find themselves caught up in. This quick preview will look at the Cottagers strengths and weaknesses and how we will approach the fixture…..
Fulham will predominantly attack down their right side and use counter attack as their main attacking weapon. As fans we are constantly told by the pundits that defending pace is a ‘defenders nightmare’….so how best to stop it? Well I’d expect Distin and co to drop deeper to deny the space in behind for Andy Johnson to exploit rather than run the risk of a straight race which would favour the former Toffee. Fulham have played 9 games in all competitions at home already this campaign and are still unbeaten with 6 clean sheets to boot. Jol’s outfit will look to Danny Murphy in the middle of the park to pull the strings – he has created a chance for a teammate on average 3.1 times per game this campaign with 3 assists so far. Dempsey provides the most penetrative threat in Fulham’s ranks. Last season he scored 5 goals from corners – the most in the division. He’ll start wide left but will cut inside and his runs will need to be tracked – we didn’t do this last season and it cost us as he slotted at Goodison – giving Rodwell the slip in the build up to the goal (left). Fulham can be a tad negative and there is still a Roy Hodgson feel about the side in their focus and borderline obsession with defensive shape. They will be happy for us to have the ball in defence and take the game to them. The chalkboard (left) shows their interceptions in a recent defeat at Wolves when almost all their pressing is applied in their own half to bring teams onto them meaning we will have time and space to bring the ball out of defence. As noted above I would expect us to defend deep to cope with Johnson – with Fulham not playing a high line either there will be a lot of space in the middle of the park which could mean we see a fair bit of the ball if Cahill drops to give us a 3 v 2 advantage in midfield. With just 4 goals from open play this season (only Stoke and Swansea have registered fewer) we have looked really toothless at times. 50% of these goals have been scored by Greek youngster Apostolos Velios in the 58 minutes he has appeared. I just can’t see Moyes starting with him though and would expect Saha to continue alongside Cahill who will pivot between the striker and midfield zones. There seems to be a question mark over Drenthe’s fitness hence his role so far has been restricted to that of an impact substitute. In every game he has made an impact though and surely he will be given an opportunity from the off in this fixture. He could potentially be pitched in on the right cutting in on his left as Coleman has struggled to make an impact lately. With Fulham having played the majority of a European away game on Thursday night with ten men, the Blues certainly have an advantage going into this one. Nobody drew more top flight games than these two last season – 31 in total – and Fulham have carried this on this season with 50% of their league games so far deadlocked. I think Moyes would settle for a point to stop the recent rot. 1-1. Attacking Midfielder (Left) A natural left footer, he will look to dribble and hog the touchline. Not being a great crosser and being on the same wing as Baines means this isn’t really a good fit as he would petrude the space Baines likes to ride into. With Osman, Drenthe & Billy ahead of him in the pecking order and Barkley emerging this wouldn’t seem likely. Attacking Midfielder (right) Probably the most likely. Moyes likes his wide midfielders to cut inside enabling the fullbacks to get right up the line and deliver crosses. This would be preferable for somebody like McFadden who is a natural leftie In a 4-4-1-1 his defensive qualities – or lack of them – would be exposed so a 4-2-3-1 with two holding midfielders mopping up would be a better proposal. Coleman has started right midfield when fit this season but he has two issues – firstly his best qualities are defensively with limited ability on the ball – secondly his stamina is poor – he has been subbed in every game this season so can’t provide an option for 90mins. The Irish marauder was flagging at times last season but our lack of options meant he was often asked to play even in spells of poor form and injury. This gives us another option especially in the home games when Coleman’s pace is less useful. Attacking Midfielder (centre) Cahill is very rarely left out and when he is Osman is firmly next in the queue for this role. McFadden played very much a second striker role in his first spell (mostly off Beattie) and to be fair his displays outshone the big lump most of the time. He has a decent long range shot in his locker too – his career highlight in the Parc Des Princes one such example and many Blues will recall his wonder goals against Fulham and Charlton. Like Osman and unlike Cahill, he does have good technique, possess vision and the craft to create opportunities and deliver a number ten role– albeit it doesn’t come off that much. 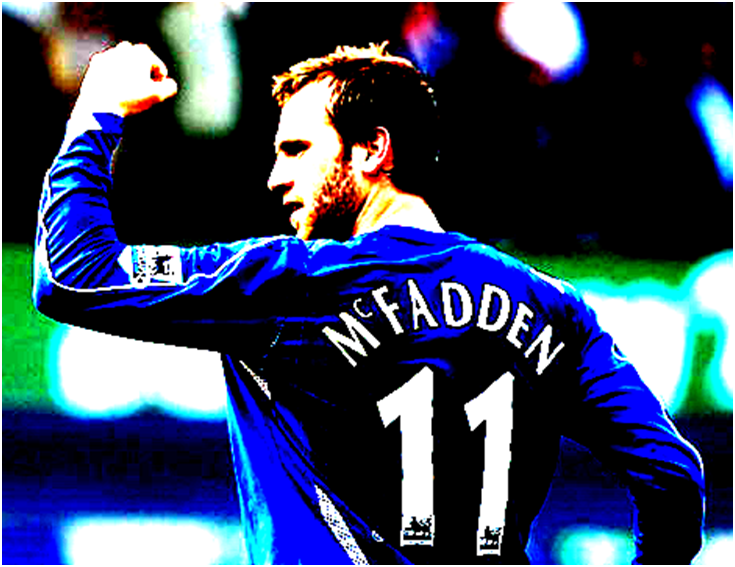 Striker – McFadden has led the line for Scotland in the past with mixed results. His goalscoring record is not fantastic. Physically he isn’t capable of leading the line for the Blues on his own. His preference is also to come deep to get the ball which is an option we already have with Saha/Cahill. I could only see him starting right up top if it was alongside a player with physical stature in a 4-4-2 . Again unlikely. If he is going to start I think it will be right midfield. I could also see cameos as an attacking midfielder in home games when we are chasing a goal and opposition defences are deep. His ability from deadballs is negated by the fact that hes a leftie and we have arguably the best left footed delivery in the division already. All in all we are short on options in right midfield and need some cover – we have limited options in terms of finance and the kid knows the club and most of the players already. He is flexible in terms of positioning and can be interchangeable in the attacking midfiled berths in a 4-2-3-1 (something Coleman can’t do) Granted, it sends out the wrong signals to bring somebody back to the club who was deemed not good enough in his prime and who now carries a weaker physical record – but desperation is perhaps a tad harsh. The pragmatic view is that we have no transfer muscle and this is probably as good as we can get to boost squad depth– its little more than a stop gap move which probable suits both parties well. Team wise, the line-ups proposed here on Wednesday were almost correct – the only difference being Ivanovic coming in for Luiz at the back. 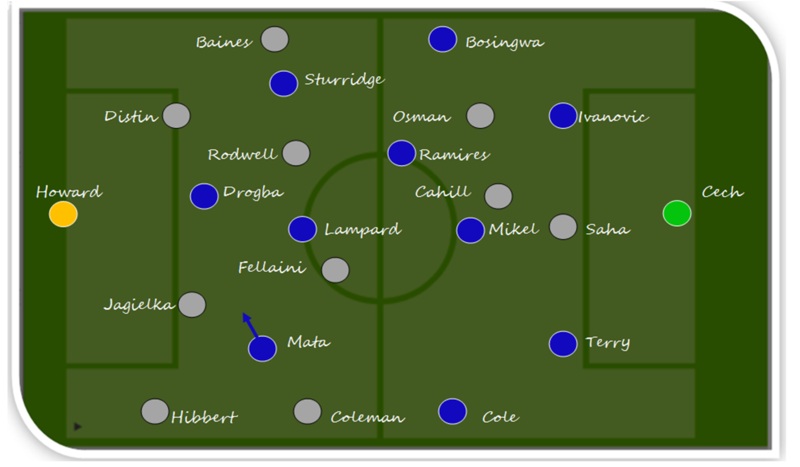 It was very much 4-4-1-1 for Everton with Cahill’s dual role being to assist in midfield and pivot to support Saha. In previous games Moyes has looked to Fellaini to stop the supply to Chelsea’s attacking players which comes from Mikel . This didn’t seem on the agenda yesterday – the Nigerian had 104 touches of the ball and registered a staggering 97% pass completion – the strategy was clearly to only press when Chelsea crossed our half way line. Mata was very much the main man. The preview highlighted the growing influence of him and he was to prove Chelsea’s talisman. He was heavily involved in all of the goals. Unlike with David Silva there was no man marker assigned and often Mata would drift from left to right to centre with Hibbert/Fellaini/Cahill taking it in turns to pick up tracking duties. Badly. The Spaniard’s utilisation of space and movement was the key difference between this Chelsea side and the more rigid teams we have faced at the Bridge in recent years. Still, we contributed to our own downfall with some truly kamikaze defensive work. For the first goal Mata (above) was allowed to waltz inside with no Everton player pressing and dink the ball over the top – this shouldn’t have been a surprise as he did exactly the same trick in Chelsea’s last home game against Swansea for Torres opener. 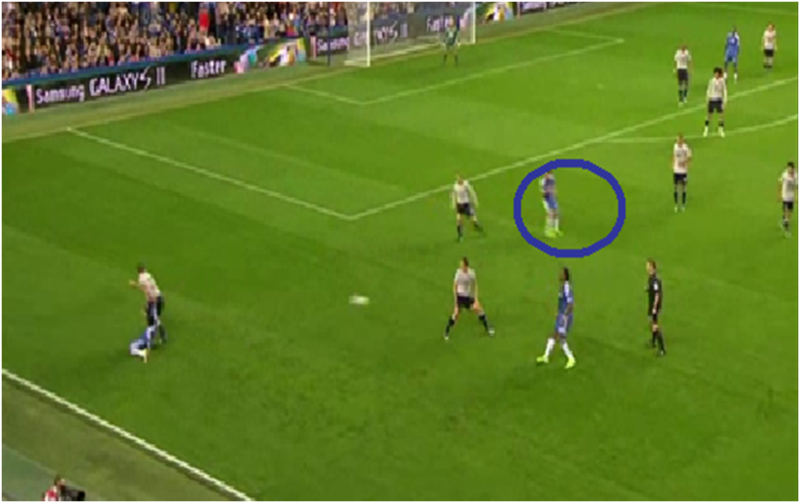 Coleman and Baines were also guilty of Mata watching as they criminally switched off. The free kick which led to the second goal (above) came from Mata dragging Hibbert inside enabling Cole a one on one with Coleman – the Irishman’s challenge was a tad rash > these two players really don’t like each other . For the final goal (below) our right side was again exposed with dire consequences enabling Mata time to run and pick out Ramires. Fellaini appeared to be targeted by Chelsea and whenever he got on the ball he was pressed intensely. The Belgian was dispossessed 7 times – comfortably more than any player on the pitch. As has been mentioned on here regularly, the departure of our best passers Pienaar and Arteta has hit us hard and resulted in a shift in style and us playing on average 100 passes less per game than this stage last season. Yesterday we posted just 31% of the play – in the corresponding fixture last season it was 43%. Our average passing sequence was 4 while Chelsea’s was 7 which speak volumes. The result of not being able to sustain any period of possession in the opponents half is that it puts intense pressure on our defence which at the moment looks very shaky. When we did win the ball back we were too deep .Credit to Chelsea they kept us pinned in for long spells – the home side keep a high defensive line which enables them to compress play in opponents halves meaning when we did get the ball we were often crowded out and possession was lost again. At times like this an out-ball is required – Saha and Cahill will always come short away from the opposition goal – we needed someone (Drenthe?) who could go the other way and expose the space in behind Chelsea’s high line. Baines has been our key attacking weapon but as the below average position shots (below left) show he was isolated yesterday – compare this with last season (below right)and the proximity of Pienaar (20) which aided the combination play between the two which often enabled us to build possession and relieve pressure on our defence – Something we have failed to do in the last 3 outings. Our wide options are dreadful. Osman did some decent things yesterday but he hasn’t got anywhere near the storming form that lit up our end to last season. He was dispossessed far too easily yesterday. On the other flank Coleman’s pass completion was inept – at 68% the poorest of any player on the pitch – and at time he really does show poor distribution. He has delivered just 3 completed passes into the opponent’s 18 yard box in 3 games and for an attacking winger this is not good enough. The substitutions clearly made an impact. In 58 just minutes of bit part sub roles Velios has scored 2 making him our top scorer (!) Drenthe’s cameo roles from the bench have shown he can provide the penetration we lack – we certainly need things to be freshened up . Both should be in contention for next week’s trip to Fulham.